Is Matthews Haunting Specter's Footsteps? Somewhat surprising news today from the pollsters at Rasmussen: If Senator Arlen Specter were facing a challenge from MSNBC Hardball host Chris Matthews, Specter would be lucky to squeak by with a win. According to the poll, Specter leads Matthews, a Democrat, in a hypothetical match-up only 46-43. "Who says the Republicans are dead? 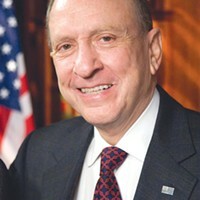 Sen. Arlen Specter has the highest job approval rating of any major Pennsylvania pol and would knock off Chris Matthews by 12 points if the Hardball host decides to run against him. Matthews has been on MSNBC wall to wall during the election season, but is a question mark for 60 percent of the voters." Indeed, 60 percent of voters told Quinnipiac that they hadn't heard enough about Matthews to have an opinion. And I'm guessing many of those who do have an opinion are misinformed. I know people who think Matthews is a Republican, perhaps because that's how most sexist on-air gasbags roll. In other findings, Rasmussen says 40 percent of Americans wish the time between Election Day and the Inauguration was shorter. 45 percent disagreed. There is no word, meanwhile, on whether Americans wanted to shorten the time between Election Day and the next election cycle. I guess the pollsters have already asked that one for themselves.